Nearly twenty years and over 600 issues of the Warren Record have been newly digitized on DigitalNC. While our collection previously only included issues from the years 1929-1938 and from 1959-1970, this new addition includes over a dozen years stretching from 1970 to 1989, which helps our collection become that much closer to being complete. Published since 1896, the Warren Record is a weekly newspaper that serves the readers in Warrenton and Warren County, NC. Many of the articles include local news concerning citizens or Warren County. For example, the 1986 article above was about the alarming increase in black bear sightings in Warren County and advice for readers about what to do in case they see one. A 1970 article about the changing census in Warrenton from 1960 to 1970. Many articles written in this time period were about other municipal issues, like elections, political developments, and census data. In the August 1970 article on the left, the Record announced that Warrenton’s population had dropped 7%, from 1124 residents in 1960 to 1046 ten years later. Warren County’s population also heavily dropped that decade, with its 22% drop being the largest on a percentage basis of any county in the state. A 1989 article about the advent of cable television coming to Warrenton and Norlina. Other articles were simply about local developments that could interest residents of Warren County. 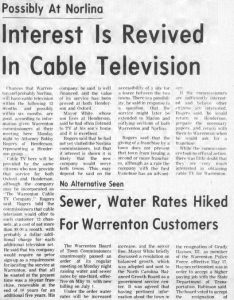 In the May 1989 article on the right, the Record announced that Warrenton and Norlina would be receiving cable television within the next year. People living in nearby Henderson already had cable, and the same company would be rolling out 12 channels to customers at a cost of $8 per month, with an extra dollar for every additional television. To browse through other materials from the Warren County Memorial Library, visit their partner page or visit their website here.